DC’s Legends Of Tomorrow has really hit its stride in the back half of its second season, and frankly I’m surprised by just how much I’ve enjoyed the last two episodes. For a long time I wouldn’t consider Legends an especially high-quality TV series even if I liked what it was doing, but since it’s come back from hiatus, it’s embraced a sense of wonder and fun while making major adjustments to its plotting and deepening the character relationships. In the new year, the show has been regularly making strong decisions: The George Lucas-centric “Raiders Of The Lost” had a delightful sense of humor and a mission that created high personal stakes for the heroes in a clever way. “Legion Of Doom” fleshed out the show’s team of villains and helped viewers understand their motivation. The introduction of evil Rip Hunter gave the team an enemy that most of them had an emotional connection to, and this cast has become a true ensemble, with each character and performer bringing out a different facet of the others. Legends is still hokey and fairly unambitious on a formal level, but the creative team is willing to take more chances and think bigger with the overall storytelling. The Legion of Doom was an especially smart decision after the failure of Vandal Savage as a villain, and adding antagonists that have already been established in the Arrowverse gave the series a lot more depth. 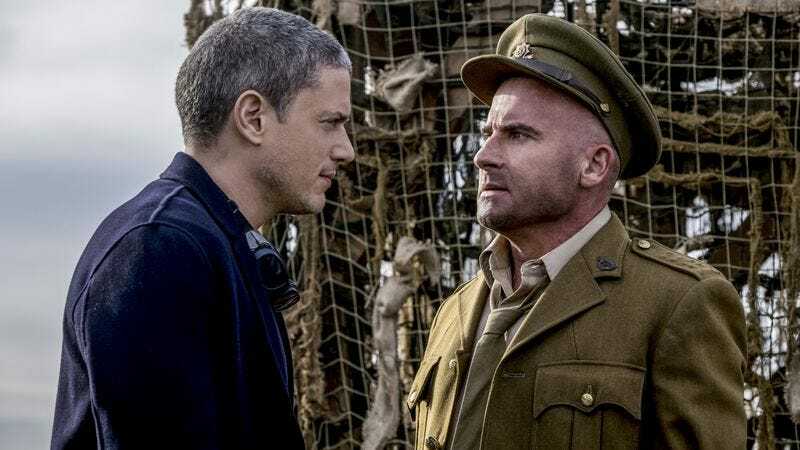 The Legion of Doom is finally completed in “Fellow Of The Spear” with the concrete arrival of Leonard Snart, who hasn’t been a hallucination in Mick’s mind during his occasional appearances this season. He’s a past version of Captain Cold plucked out of the timestream by the Legion of Doom before he joined the Legends, and he’s been manipulating Mick when the rest of the team isn’t around, setting him up for the double cross he commits at the end of this episode. Tonight’s script by Keto Shimizu and Matthew Maala moves incredibly fast, and it creates a real sense of urgency that steadily builds momentum throughout. We’re charging into the final two episodes of this season at breakneck speed, and all of reality is going to be rewritten in the next chapter of this series. The Flash changes timelines and occasionally jumps to different dimensions, but it hasn’t gone to the level of rewriting reality using the magical spear that pierced Jesus Christ’s side during his crucifixion. At one point while watching tonight’s episode I explained the plot to my roommate casually walking by and I cackled wildly at the end of the summary: “The team is working with J.R.R. Tolkien in World War I to find Christ’s blood so it can destroy the the spear that stabbed Jesus on the cross!” That’s an outrageous storyline, but this episode makes it work by continuing to do what’s the series has been doing right. While it’s taken full episodes to get pieces of the Spear of Destiny earlier in the season, the entire weapon is assembled by the Legends in the first act of “Fellowship Of The Spear.” It’s surprisingly easy for the team to retrieve the other half of the spear from the Legion of Doom, and things should be pretty easy for this group. They have a time machine, several geniuses, highly skilled fighters, and multiple people with superpowers, including one guy with the potential to control the entire periodic table. It’s extremely rare to have Firestorm transmuting objects into other things, which is disappointing because it’s been my favorite thing about the character since I first saw him on the old SuperFriends cartoon. Firestorm has this amazing ability that has gone largely untapped in the Arrowverse because it makes him incredibly powerful in a way that would actually interfere with the plotting of this series (limitations are good), but he uses it this week when he turns the vault surrounding the pieces of the Spear of Destiny into a pile of jellybeans. Once the Legends have the spear, they have to figure out how to destroy it. Mick’s attempt to burn it doesn’t work, but it does reveal a phrase in Latin that gives the team the clue it needs. After learning that the spear can only be destroyed by Christ’s blood, Nate suggests that the team seek out the help of J.R.R. Tolkien, who had a theory that Sir Gawain didn’t retrieve the Holy Grail in Arthurian myth, but a vial of Christ’s blood. I have no idea if any of this is historically accurate because I’m not especially well versed in Tolkien’s interpretation of Arthurian myth, but it doesn’t matter if it’s historically accurate. It gets the team to France, 1916, in the middle of the Battle of the Somme to track down Tolkien (played Noah Wyie lookalike Jack Turner), and the writers and director Ben Bray make great use of these circumstances to craft an intense episode that poses real danger for the characters. This team has been in wartime scenarios before, but this episode is the most effective at capturing the bleakness and crushing emotional weight of being in the battlefield. The scenes in the trenches and in the field hospital reinforce how miserable this situation is, but they also show the team what it is trying to prevent by keeping the spear out of the hands of villains. Being in a warzone has a big personal impact on Amaya, who is dealing with the recent revelations regarding her future, and tending to the wounded soldiers makes her think about all the people that will die when Zambesi is destroyed decades later. Maisie Richardson-Sellers has been a worthwhile addition to this cast, and she gives a strong impression of the fear and sorrow that has overcome Amaya since she learned what’s in store for her and her people. She tries to hide it, but there’s no denying that something has Amaya extremely rattled, and Sara would be a bad leader if she didn’t notice there was something wrong. After learning about Amaya’s recent discovery, Sara tries to reassure her by telling her that even in the wake of tragedy, her granddaughter becomes a remarkable hero, but it’s not as comforting as Sara wants it to be. Like the One Ring in J.R.R. Tolkien’s The Lord Of The Rings, the Staff Of Destiny attracts people to it. It wants to be used. It whispers to Amaya in the voice of her mother to change her future. It whispers to Mick in the voice of his parents to stop their deaths from happening. It’s a difficult temptation to turn away from, and when Amaya suggests using the spear to stop the battle so they can retrieve the vial of Christ’s blood buried on the field, there’s an added level of tension because we know there are personal reasons for Amaya wanting to use the spear’s power. She says she can handle it, but there’s no way of knowing what will happen when wielding power that can rewrite all of reality, which is what makes this episode’s cliffhanger so exciting. The Legends turn on Mick a little too fast when they realize he told Leonard Snart (who wasn’t a hallucination) about their plans for the Spear of Destiny, but their reaction is understandable given the fate of all of reality is in the balance right now. They lash out at Mick and say what will hurt most, but unfortunately that’s exactly what Snart tells Mick they would do, so he begins to have serious doubts about his place on the team. Despite his protestations, Mick has become friends with these heroes, but he’s still a rogue at heart, and part of that rogue spirit comes from his feelings of alienation. 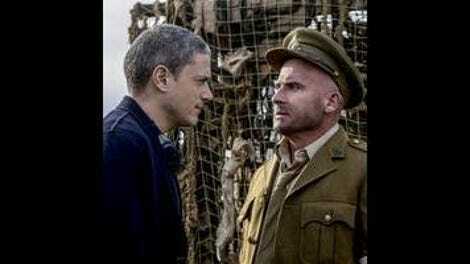 It’s easy to be selfish when you feel like no one will ever accept or care about you, and Snart is Mick’s closest friend because they share this same sense of alienation and satisfy the other’s need for companionship while allowing him to continue being selfish because they’re both criminals. Snart had a change of heart with the Legends too, but this past version of him hasn’t had any of those positive experiences. Mick also underwent some significant trauma when he was Chronos, so it makes sense that he would revert to his older self if it means he has the opportunity to give himself a better life. Left with the option of going back to a group of heroes that doesn’t completely trust him or jumping in with the villains (including his best friend) that are going to take immediate action to change the world, Mick chooses the latter, and it’s a devastating blow to not just the Legends, but all of reality. The episode ends with the Legion of Doom rewriting everything, setting the heroes up with one hell of a challenge if they’re going to save the day (and everything else). I’m on vacation next week so I won’t be writing about next week’s reality-warped Legends, but you’ll be in good hands with Kate Kulzick, who has generously offered to cover the Legends beat. The Spear of Destiny gives Tolkien the idea to have the One Ring reveal a message when it is heated, but we don’t know if Tolkien took the idea for the ring’s attractive force from the spear as well. The Legends need to ditch Ray, go rogue, and visit the crucifixion of Jesus because I want to see the show navigate that narrative minefield. Maybe we’ll end up there in the finale (I know we want, but I can dream). Jack Turner is a very cute Tolkien. Also, the dying soldier that Amaya sits with has a rockin’ bod. CW casting founds some very attractive men for this episode. Anyone else wonder if it’s intentional that the Legion of Doom consists mostly of middle aged white man?